While it’s no secret that the DMCA has had a noticeable chilling effect on a number of different classes of innovators during the last decade, it’s still disheartening to hear of creative uses of content that have been squelched by big copyright holders. Earlier this month, on the film blog The House Next Door, film critic Matt Zoller Seitz wrote of fellow House Next Door contributor Kevin B. Lee’s recent tussle with YouTube. Lee had been posting video essays on YouTube that offered critical assessments of Hollywood films, both recent and classic. As part of his essays, Lee often included clips, of varying length, from the films that he discussed. Over the years, Lee had occasionally received DMCA takedown notices via YouTube and not knowing any better, had chosen not to contest them. On January 12th, however, he received his third and final notice and in accordance with YouTube’s “three strikes” policy, his account was locked and all 140 of his video essays were made instantly unavailable. I fully agree with this comic. Fighting with DRM is a nightmare. I gave up on itunes for this very reason and I am unlikely to go back until the remove all DRM and starts using public licenses. Garden-variety downloading opens you up to civil liability, but it doesn’t make you a criminal. You’re only a criminal if you (a) infringe for profit, (b) infringe more than $1,000 worth over a 6-month period, or (c) put a pre-release copy online. Question: What are the penalties for violating the DMCA’s anti-circumvention provisions? Answer: The DMCA allows for both civil remedies and criminal penalties for violations under the anti-circumvention provisions. If the violations are determined to be willful and for commercial purposes or private financial gain, the court can order significant fines and/or imprisonment. This work (the xkcd comic) is licensed under a Creative Commons Attribution-NonCommercial 2.5 License. 11. Finally keep records of the number of takedowns and terminations of accounts to prove you are following your own takedown procedures. Note: these best practices are from a cursory reading of the opinion please contact me (Brian at freedomforip dot ORG) if you have other ideas or thoughts. I strongly recommend consulting counsel when crafting your own takedown response, qualifying for the safe harbor provisions of the DMCA is extremely important for many websites. This ruling provides valuable guidance to companies that host video, audio, and text files on behalf of users (see, e.g., Muxtape). Too many “Web 2.0″ start-ups are careless about the requirements of the DMCA safe harbors. They don’t register a Copyright Agent, or keep good records of their responses to takedown notices, or have a demonstrable policy of terminating “repeat infringers.” Sure, doing this “compliance” work costs time and money. But, as the Veoh decision demonstrates, the payoff can be enormous, since copyright is almost certainly the biggest liability risk these sites face. Final note: This opinion does NOT address fair use with regards to DMCA takedowns. Best practices should be customized to take creative reuse and political speech into account. I am not aware of a working model that currently does this. This is a huge win for free speech, many current DMCA request are automated drift netting that capture political and education fair use in the process. A judge ruled in Lenz v. Universal, the “dancing baby” case, that content owners MUST consider fair use before sending takedown notices under the Digital Millennium Copyright Act (“DMCA”). Reviewing DMCA take downs by hand and taking free speech into account is the least we can ask for. The International Olympic Committee (IOC) filed an automated copyright takedown yesterday with YouTube for hosting video of a Free Tibet protest at the Chinese Consulate in Manhattan Thursday night. This is one of the worst ways that the DMCA and copyright can be used. Automatic procedures that allow for free speech to be censored cause irreparable harm. The video is clearly criticism as it depicts Tibetan monks being arrested and a parody of the Olympic logo being used as handcuffs. YouTube automatically pulled the video in response to the takedown claim. 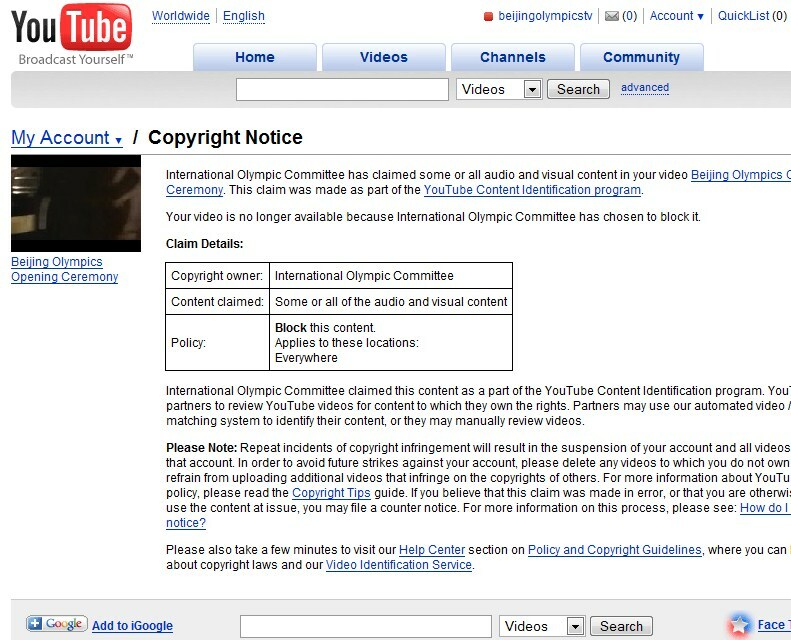 I hope YouTube or the video producer sues the IOC for abuse of the takedown procedure. NYC Chinese Consulate Projection Action 08.07.08 from Students for a Free Tibet on Vimeo. Oregon does not want people to copy or distribute the law!? Do they not want people to actually find or read the law or even make the law accessible to people with disabilities? Oregon, represented by legislative council Dexter A. Johnson, has sent out DMCA takedown requests to free services that provide copies of the Oregon Revised Statutes online. Oregon is claiming that they have made the code avalible through their own website and have the right to sell the law to other for distribution. The Oregon state website is terrible. The site does not meet the core basic requirements of the HTML standards, it has no meta data, poor search features and weak display options. The Oregon website is not accessible to people with disabilities. It fails to meet Section 508 accessibility requirements. There is a strong fair use argument for anyone that republished the law adding to the public welfare, especially if they are not charging for access. I hope that Oregon sees the error in their ways and starts helping people that are working to make the law usable and accessible instead of wasting time on frivolous copyright claims that only harm the people. Copyright was created to encourage people to create new works, not to hide the the law from the people.